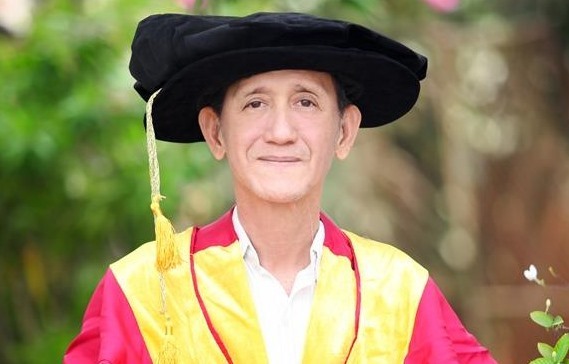 Herbalist Doan Van Khanh, 60, from the southern province of Tien Giang, has become the first Vietnamese farmer to be awarded an honorary doctorate by the University of Florida for his research into the medicinal properties of the Long Thanh pomelo, a specialty of his homeland. He talks with Ha Nguyen about his work. Why have you invested your time and effort into researching herbal medicine? I came across traditional medicine by chance. In 2006, there were rumours that eating pomelo caused breast cancer in women. This obviously affected fruit farmers in Tiền Giang Province. I witnessed the ripe fruits falling from the trees lying untouched in the orchards, and it was painful to watch. I’d heard that the fruit could be used to treat a number of human ailments, so I decided to start my research. First, I resigned from my post as chairman of the War Veterans’ Association in Song Thuận Village to travel far and wide to learn about traditional herbal medicines. Several years later, I’d learnt about the pharmaceutical values of pomelo and how to combine them with other herbal ingredients to produce cosmetics and medicines. Did you face any criticism about your work? Many people still did not understand the properties of pomelo. They say that my products are unsafe. Despite this, I invested my time to produce non-chemical medicines sourced from nature. After two years, my efforts paid off. I successfully extracted attar from pomelo flowers that can be used to stimulate hair growth, and pomelo juice which can reduce high liver enzymes, blood pressure and cholesterol. These two items won high prizes at the Tiền Giang Competition on Technology Innovation in 2008 and certificates from the Việt Nam Outstanding Invention the same year by the Unions of Scientific and Technological Associations of Việt Nam. What did you do after these successes? I continued my research and produced 20 kinds of medicine and items from pomelo, dừa sáp (sáp coconuts and a number of plants in my garden. These medicines can treat stomachaches, chronic large intestine, multi-joint inflammations, sciatic nerves, spinal degeneration and many other ailments. They are from my own 8,000sq.m garden and I’ve signed contracts with villagers and farms inside and outside Tiền Giang. Our herbal medicines have been selling well since I officially established the Long Thuận Private Enterprise to develop production. Fruits and medicinal herbals are grown following VietGAP (Good Agriculture Practice) standards in my garden. I can ensure that all input materials are organic. How do you deal with insecticides? We try not to use pesticides and instead I’ve researched several herbal medicines to deal with insecticides. Thanks to that, all my products are recognized as organic through regular tests by relevant agencies. We have also earned certificates such as Vietnamese High Quality Products, CGMP (Cosmetic Good Manufacturing Practices) and ISO-HACCP (Hazard Analysis and Critical Control Points). But much more important is that our products have gained good reputation among local and foreign customers. My main purpose is to produce herbal medicines to treat poor patients. I’ve never tried to get rich from my patients. In fact, many patients facing chronic ailments arrive at my home for me to treat them free of charge. Yes, it’s one of my deep concerns. Every year I contribute a billion Vietnamese đồng to build houses for the relatives of invalids and those who have sacrificed themselves for national unification and freedom. I also help poor households and build electricity grids in rural areas. Can you say something about yourself? Earlier this year, I was very surprised to become the first farmer in the country to be awarded an honorary doctorate in traditional medicine by the University of Florida in the US. Long Thuận was the only company to win three gold medals and certificates at the ASEAN Food Conference held in HCM City last year. In 2016, the Prime Minister awarded me a certificate for my achievements on helping people who had joined the national revolutionary cause. What are your plans for the coming years? I plan to expand my workshop and promote the business to increase the incomes of my workers. I’m trying to do more research on new herbal medicines. So far we have already exported our products to Japan, the US, Canada, France, South Korea, Germany and Russia, and we plan to expand our reach to other countries around the world.